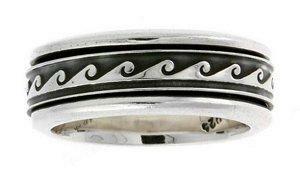 Waves are a popular nautical ring design. Any couple with a longing for the sea may enjoy the beauty and uniqueness of nautical wedding bands. From simple to elaborate designs suitable for a wide range of budgets, these stunning wedding rings are perfect for an oceanic union. Nautical rings can be the perfect choice for any couple with a connection to the sea, whether they are planning a beach wedding, shared an intimate beach wedding proposal, or simply have a passion for sailing, oceanography, scuba diving, or marine life such as fish, whales, turtles, or dolphins. For other couples, the rich symbolism of nautical rings is appealing. The vast expanse of the ocean can be symbolic of the unending bonds of marriage, and many sea creatures mate monogamously for life: the perfect attribute to embrace with wedding rings. Water Sports: Scuba gear, sail boats, fishing gear, and other aquatic equipment can be featured on intricate wedding bands. Marine Life: All types of marine animals, including fish, sea birds, sea turtles, starfish, sea horses, and whales can be found on ring designs. Dolphin wedding rings are particularly popular. Shells: A variety of shells can encircle a thick wedding band, or a single shell can be used as a focal point for a more delicate design. Marine Equipment: Lighthouses, sailing knots (similar to Celtic wedding rings), and ships' wheels are popular icons on nautical rings. Fantasy Sea Creatures: For a more unusual ring design, couples can opt for mermaids, pirates, or other exotic sea symbolism. Waves: Simple and classic, wave wedding bands can be subtle or bold depending on whether the wave is textured as part of the band or etched strongly into the design. In addition to bold nautical ring designs, couples can also choose more subtle oceanic accents for their wedding rings. For example, a mokume gane ring can be designed to resemble waves, or a hammered tungsten wedding ring could resemble turbulent surf. Gemstones such as pearls, aquamarine, turquoise, sapphire, and mother of pearl can also add a beautiful nautical touch. To illustrate the detail of an intricate nautical design, many marine themed wedding rings use several precious metals for color and contrast. Diamond wedding rings are also popular, with the gems acting as glittering accents to the overall design. 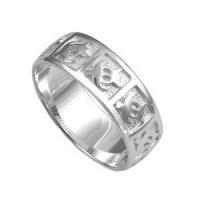 Nautical ring designs can be difficult to find through mainstream jewelers. Specialty artisans who work with nautical and marine themes are more likely to offer high quality, unique designs, and online retailers also have a wide range of nautical wedding rings available. deSignet International: Collection of nautically-themed plain and diamond accented bands including scuba divers, stylized waves, knots, and dolphins. Seawear: Unique nautical designs including seabirds, tricolor braids, and a lighthouse scene band. Sea life collection also includes sea turtle and dolphin bands. Seametal: Handcrafted, elegant designs including dolphins, seahorses, and starfish in wedding and engagement ring designs. Dive Silver: Aquatic themed rings include sea turtles, waves, whales, diving goggles, sharks, shells, starfish, manatees, and more in gold and silver. Nautical Jewelry Originals: Choose-your-fish bands can be made with redfish, tuna, tarpon, sailfish, marlin or other options for customized bands. Galleon Jewelers: Wide selection of nautical designs includes fish, sea life, ship's wheels, shells, propellers and more. Toe rings are also available. The cost of a nautical ring can range from less than $20 to several hundred dollars or higher depending on the overall quality of the craftsmanship and the uniqueness of the design. One-of-a-kind wedding rings are naturally much more expensive, but they also usually feature much more detailed, clear designs and higher grade materials. Less expensive rings can be just as lovely, however, and couples interested in these types of rings should shop around for the best design and price to fit their budget. A couple with nautical wedding bands may love the sea, but their rings will not. Seawater can be highly corrosive to precious metals and gemstones, and the additional minerals and chemicals found in seawater can discolor rings. Wedding rings should always be removed before swimming, diving, or any other activities where they could be easily lost or damaged. It is also important to remember that fingers may shrink in cold water, making rings looser and more easily lost. Lost rings are also hazardous to local fish, and couples should take care that their wedding rings do not inadvertently become bait. 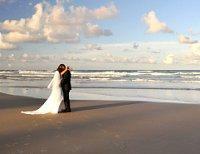 Say "I do" by the sea. Because many nautical rings are highly detailed, they require diligent cleaning to be kept looking their best. A small, soft brush should be used to remove any dirt, dust, or oils from etchings and niches, and the rings can be soaked to help loosen deposits if necessary. Couples should always consult with the jeweler for the proper cleaning methods for their particular rings based on the gemstones and metals used. Nautical wedding bands are highly symbolic and unique options for couples to share. By choosing a sea-themed ring, couples not only symbolize their love for one another, but also their love for the ocean and all its wonders.